Nestled beneath the leeward slopes of the world’s largest dormant volcano, Haleakala, and the year round warm Pacific waters of Maui’s sunny south shore lies a green oasis with a distinguished address…. The Grand Champions Villas are just a 10-minute walk from Wailea’s five beautiful beaches and three-mile coastal path, surrounded by lush, tropical gardens, championship golf courses, and a world-class tennis facility. Within the quiet community of Grand Champions, we offer a spacious studio, approximately 750 sq ft, one bedroom, one bath apartment, with fully equipped kitchen, living/dining room, king-size master bedroom, and open-air lanai with beautiful garden views. 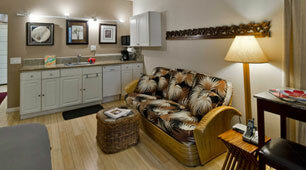 In addition, we have an elegant studio apartment with “kitchenette” (no stove). 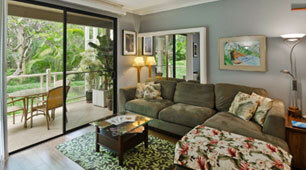 Jungle foliage and bird calls surround your tiled lanai, filling the room with tropical colors and sounds.